Perfect for sensitive skin with 0% fragrance and 0% colouring. This highly effective laundry detergent is endorsed by Allergy UK and recommended by Sam our founder as the the product she uses herself to tackle her own eczema prone skin. Being free from perfume means those irritated by synthetic perfumes can use with product without worry. It washes effectively at temperatures as low as 30℃ and is dermatologically tested for sensitive skin. Try it, we are sure you won't be disappointed, its what we use at home! Established over 35 years ago in Belgium, Ecover is the original green cleaning company. They have always led the way in terms of sustainability and performance of their products. They use plant based ingredients rather than the petrochemicals used in mainstream products and make the products in their own eco-factories. Their bottles incorporate sustainable plant based plastic and recycled plastic too. 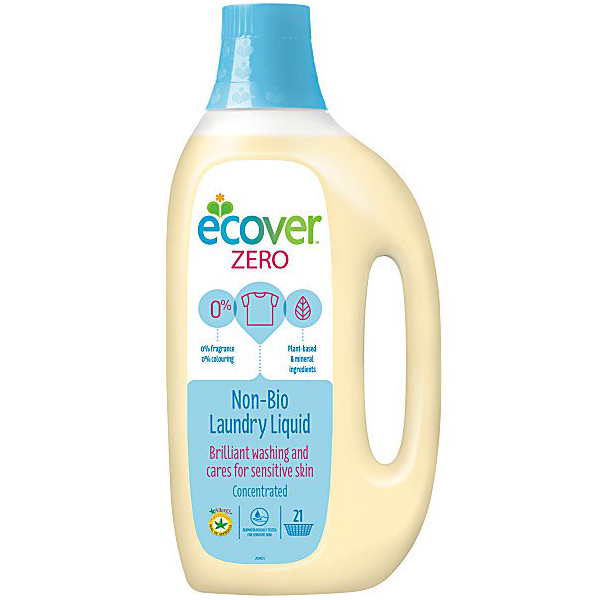 Changing the world takes time, but brands like Ecover who make eco friendly cleaning accessible to all make changing the world for the better a realistic possibility.